Just stumbled upon these concept images of HTC HD3 and thought I should share it with you all. This one, unlike any previous leaks that we have seen looks closer to what could be the real deal come this fall, when Windows Phone 7 Series devices will finally roll out to the masses. Hardware wise, this phone is said to sport a 1.5Ghz Snapdragon processor with 1GB of RAM and ROM. The built-in 8 megapixels camera will be able to shoot videos at 720p HD resolution. There will also be a front-facing camera for video conferencing, along with the three standard Windows Phone 7 Series buttons: Start, Search and Back. 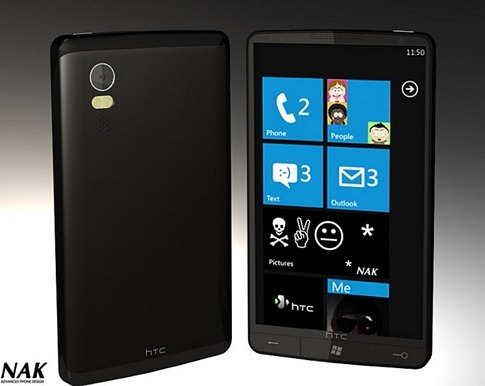 I want HTC HD3 right now! I want it but with Android. Windows really, that's still around. Too bad. thses images are supposed to make me want the right now??! !…….FAT CHANCE!!! It might be more believable if there was no support for External memory (aka. SDHC) because those are ruled unnecessary for WP7 and thus unsupported. Hd2 hasn't come out yet. March 24, 2010. 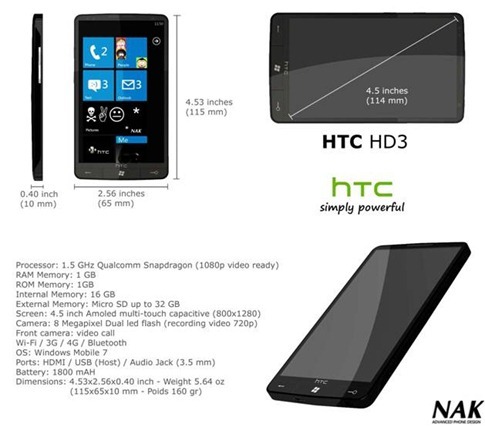 So um actually this device couldn't exist considering the only known supported resolutions for WP7S are QVGA(width x 800 in portrait mode) and HVGA(width x 480 in portrait mode). 800(width) x 1280 in portrait mode is not either of those. So um nice try retards. winmo is not bad at all… i might actually prefer it over wseries7. and if i can get in a snapdragon processor for cheap well… i guess that would be HD2 so this might not completely cater to me other than it means hd2 prices will go down.